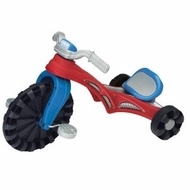 Ride in style with this cool trike! It features a 14" front wheel and a sturdy, three-position adjustable seat to accommodate different size riders. Sturdy construction with knobby wheels ensures a steady, safe ride for little ones. Measures 33" x 19.5" x 21". 33" x 19-1/2" x 21"